SAO PAULO: Netherlands coach Louis van Gaal admitted he wanted to use substitute keeper Tim Krul in the penalty shoot-out defeat to Argentina on Wednesday. Van Gaal said he would have taken off goalkeeper Jasper Cillessen for Krul -- in a repeat of the gambit which won the quarter-final with Costa Rica -- but had run out of substitutes. "I would have done it by I had already used my three substitutes so I couldn't do it," van Gaal said when asked if he'd thought about bringing on Krul. It meant that Krul, who saved two spot-kicks against Costa Rica, was a frustrated spectator on the bench as Argentina prevailed in the shoot-out 4-2. 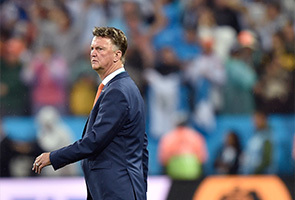 The defeat had an extra twist for van Gaal because Argentina keeper Sergio Romero saved two Dutch spot-kicks. Van Gaal worked with Romero during the player's four-year stint at AZ Alkmaar. "I taught Romero to stop penalties, so that hurts," van Gaal joked.